This series of projects set out to explore the way that people have used the harbour over time and influenced the changing landscape. These projects provided valuable opportunities for local volunteers to become involved in archaeological research within the Area of Outstanding Natural Beauty. This project was undertaken by West Sussex Archaeology in 2006. A field-walking handbook was produced to guide non-professional taking part in the work. Three suitable fields were field-walked. Arable fields are best for field-walking, which means that about half the total acreage of the AONB is suitable - some 200 fields and about 2,050 acres. The archaeologists colour-coded fields according to their priority. Priority was given to those fields that contained or lay next to known archaeological sites or artefacts. Twelve fields on Hayling Island and Warblington are prioritised to investigate possible Roman villas, Bronze Age sites and a possible deserted medieval village. Another deserted medieval village is thought to have existed at Manhood and six fields are prioritised here. Field-walking 19 fields around Apuldram and on the Bosham peninsula will help identify Iron Age and Roman occupation, with a further four fields on Thorney Island and Prinsted will help investigate areas of Roman and prehistoric finds. Field-walking the eight prioritised fields around Chidham will help understand the important Iron Age and Roman salt-working sites known on the peninsula. Three fields have already been field-walked. The best results came from a field to the west of Apuldram Manor where a large quantity of medieval pot was found, and where patches of ploughed-up oyster shells may represent the remains of rubbish pits. There has been much debate about whether a medieval village used to exist at Apuldram, and the finds suggest that further work could profitably be done here. 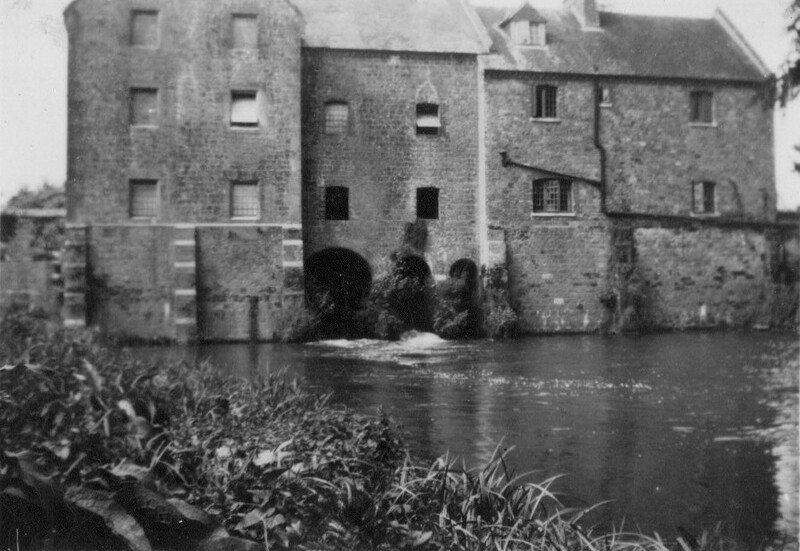 There are no visible building remains and no crop marks are known, but when Apuldram was surveyed in 1433 by the monks of Battle Abbey it consisted of at least three streets. There is no mention of a village in the 1086 Domesday survey and the earliest reference to ‘Apeldreham' appears in the early 12th century. The deserted medieval village of East Itchenor is thought to have existed near Birdham. Field-walking here south of Westlands Lane failed to recover evidence of the village. The third field to be field-walked lay near Nutbourne, but apart from the occasional flint flake and medieval and post-medieval pot, nothing of significance was found. Reports available at the Harbour Office, Itchenor. This project produced a shore-walking methodology and provided training for volunteers. 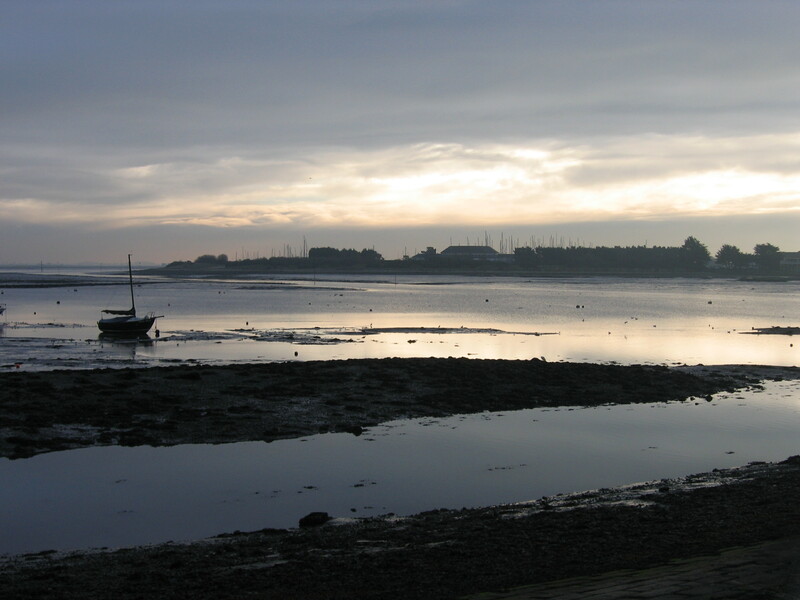 Five areas of shoreline within the AONB were also shore-walked: Emsworth to Langstone, part of the east coast of North Hayling, Cobnor to Prinsted, and the east and west coasts of Thorney Island. As might be expected, artefacts from many periods were found. Brick and tile, slag from industrial processes, metalwork, shell and fragments of clay tobacco pipe were identified and their locations were plotted. The retained finds consisted of two sherds of medieval pottery and 18 struck flints. The prehistoric flints were not sufficiently distinctive to be closely dated, but might have been Mesolithic or Neolithic. Ten flakes were identified, four blades, two scrapers and one core. Shore-walking over the past two decades or so has produced much interesting evidence. Previous finds of flints from the foreshore - especially those dating to the Neolithic period - suggested that tools were made from locally available material on the spot for immediate use and discard, a non-domestic assemblage. The AONB was not occupied during the Neolithic period, instead the area seems to have been used for seasonal, short-term grazing of animals. The flint finds from the shore-walk do not conflict with this hypothesis. 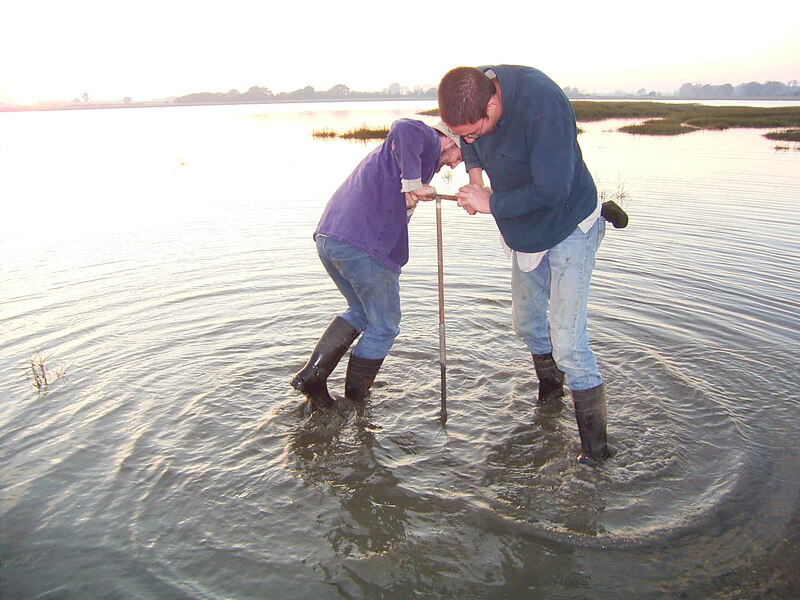 Maritime Archaeology Ltd undertook a desk-based assessment in 2006 to identify foreshore structures that were then surveyed. The aim of the project was to gather data on the archaeological potential, state of preservation and possible threats to structures within the intertidal zone. This information would then be used to understand the intertidal cultural resource, particularly in relation to the development and use of the harbour. The thirty-three sites surveyed give an indication of the changing nature of Chichester Harbour, especially its changing shoreline and economic development. Most of the sites appear to date from the last 200 years. Some structures, such as groynes, lay far from the modern shore, indicating how the shoreline has retreated. A large number of structures surveyed were associated with three industries: oyster farming, salt production and maritime transportation, illustrating the importance of these industries in the post-medieval period. One of the largest structures surveyed was a large post-medieval wharf at Warblington that consisted of three possibly associated features. The wharf was built of square timber piles, some with bracing timbers and iron bolts, a compacted surface - probably a slipway - and the timber posts of a coastal defence revetment. Another large structure at Rookwood is probably the remains of three jetties forming a small marina. Three possible groynes were also identified. A groyne is a method of coastal defence against erosion that run perpendicular to the shoreline into the sea. Such structures can illustrate how much of the coast has been eroded since they were built. The landward end of the groyne west of Ellanore, for example, lies 30m from the current shoreline. 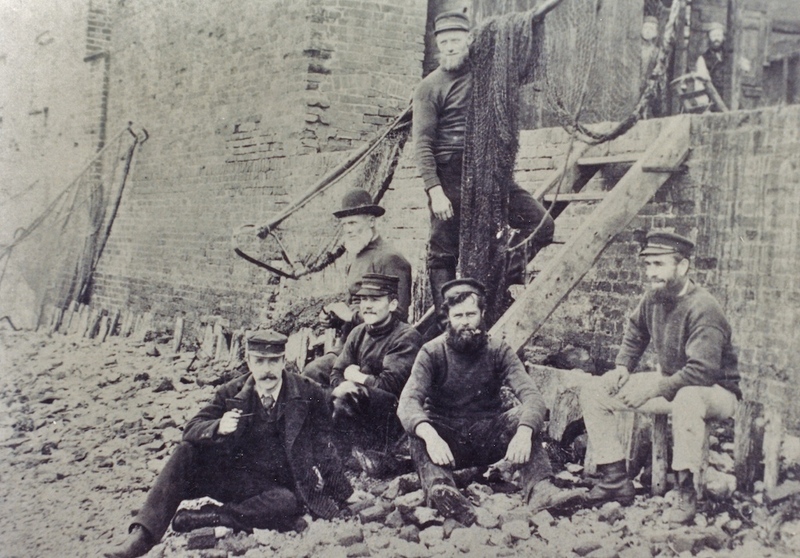 The oyster industry was an important one for the harbour. Most of the oyster beds surveyed were built in a similar way: rectangular, with a breach on one side for a sluice to control water flow. 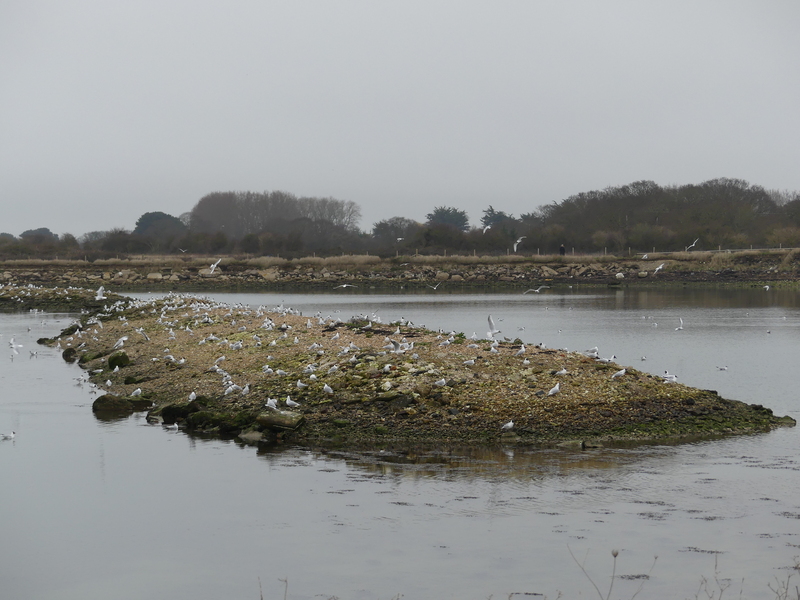 Oyster beds at Chalkdock are an exception and appear to be circular. The oyster bed complex at Prinsted was the largest and there are ten well-preserved oyster beds at Emsworth. Walkways built of compacted sands and gravels are still visible at both these latter sites. Causeways were also surveyed, including the Wadeway and Fisherman's Walk. An Anglo-Saxon (early medieval) causeway was thought to be located near Longmore Point, but could not be found. Salt working dates back to the Iron Age in the harbour. Three were surveyed, the earliest at Thornham Boatyard. This dates to the Roman period and consists of three small raised areas, built of medium compact sandy gravel. 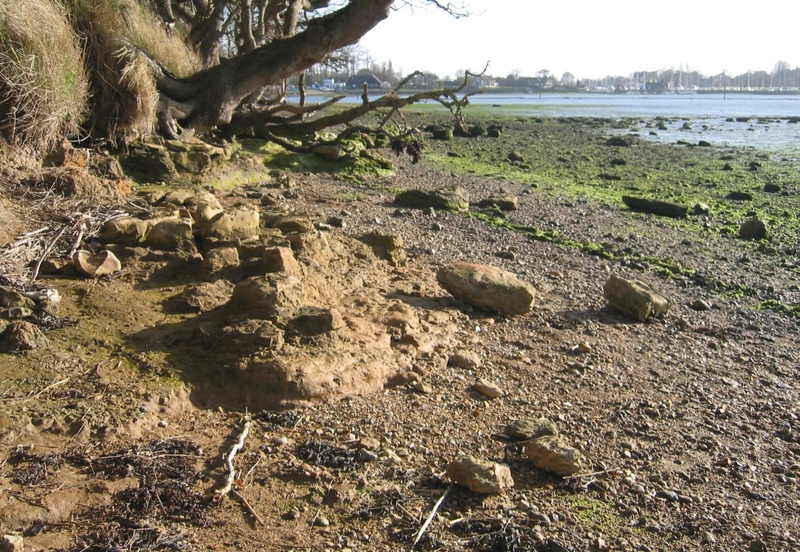 A seawall or ‘cut' was built by 1815 between Chidham and Bosham with the intention of reclaiming land in the northern part of Bosham Channel. The seawall was destroyed by storms in 1825, but the investment in its construction shows how valuable agricultural land was to the local economy. Fisherman's Walk is a 340m long causeway snaking from Emsworth to Fowley Rithe but stopping short of Fowley Island. On the first edition Ordnance Survey map of 1866 it is marked ‘Westwood's Road'. Archaeologists from Maritime Archaeology investigated the causeway by examining historic sources, such as maps followed by a field survey in advance of limited repair works on the surface of the causeway. The map evidence proved useful for dating the causeway. Sheringham's chart of 1848 depicts the causeway, but Greenwood's map of 1826 does not, suggesting the causeway was constructed some time between these two dates. Fowley Island is featured on Milne's 1791 map and subsequent maps. The causeway seems to be linked to the oyster industry, although there is no direct evidence of this until 1885 when the Fowley Island Oyster Company was formed. The 1866 Ordnance Survey map shows oyster beds at the northern end of the causeway, and the 1898 OS map shows two oyster beds on Fowley Island. The harbour's oyster industry collapsed in the first half of the 20th century, but the causeway seems to have been used for other purposes: on the 1952 OS map salterns are marked on its western side, and ‘Perch' is annotated on its eastern side, perhaps referring to poles to help manoeuvre boats or secure them to. None of the maps shows the causeway extending all the way to Fowley Island. It may have been possible to traverse the gap between the end of the causeway and the island by foot since it was colonised by eel grass that would have provided enough support to walk on. As the eel grass declined over the last 60 years, erosion of the upper firmer layers of this area increased making such a crossing impossible today. 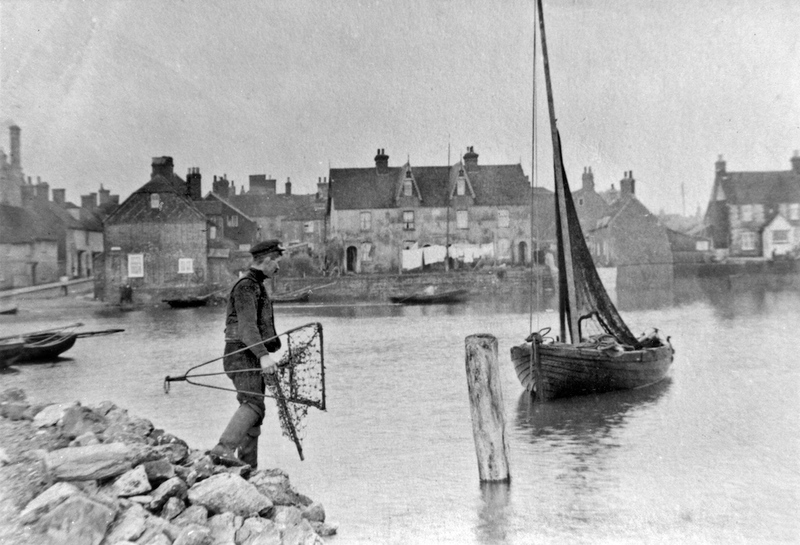 Oral evidence suggests that fishermen used the causeway to haul their vessels through the Emsworth Channel with ropes (‘warping'). This may explain the modern name of the causeway. The field survey included a photographic record of the causeway that was also mapped with a Global Positioning System. The survey revealed that the causeway consists of a semi-compacted gravel surface with some concrete slab edging, installed in the 1980s, and earlier timber batons held in place by pairs of timber pegs. Erosion has revealed details of construction, including the use of branches to form a surface. 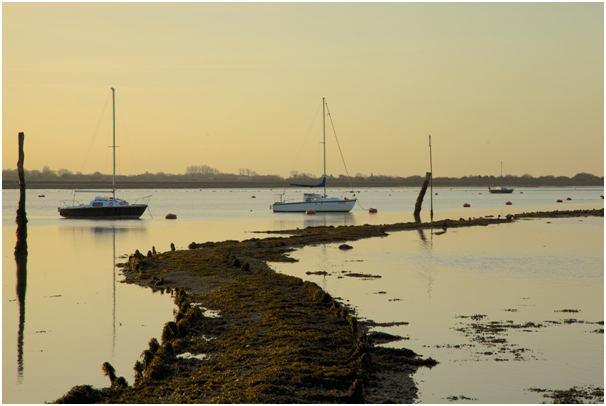 Maritime Archaeology Ltd investigated the Wadeway - the causeway that runs from the village of Langstone towards Hayling Island. The date for this feature has been the subject of much debate. Archaeologists first consulted maps and other records to get as much information on the causeway as possible. The first written reference to the Wadeway was in 1552 and referred to a toll for crossing the causeway. The first definitive map evidence of the Wadeway was in Taylor's map of 1759. The settlement of Wade was established by 1086 on the northern shore. The decline of the Wadeway began in 1817 when permission was granted for the construction of a bridge linking the mainland with Hayling Island. In 1821, ‘New Cut' - part of the Portsmouth to Arundel Canal - severed the causeway. The next stage of the archaeologists' work was to survey the Wadeway. They found that the causeway survives as three segments, with the northernmost the best preserved and consisting of gravel held in place with timber boards. The distinctive red-orange colour of this part is due to gravels that have naturally accumulated over time and are not part of the original structure of the causeway. A natural channel separates this part of the causeway from the central segment which is truncated at its south end by ‘New Cut'. Large areas of the southern segment are eroded or submerged beneath silts. A small excavation was carried out on the Wadeway. This showed that clay that had accumulated on the natural groundsurface had probably originally been salt marsh or part of mud flats. The Wadeway had been constructed by cutting away this clay and backfilling the resulting 1.2m deep ditch with gravel. Pieces of timber had been used to consolidate the edges of the structure. No pottery or other artefacts were recovered that could date the causeway, but pollen taken from environmental samples was compared to the types of pollen that might be expected at different times in the past to give a broad date. The clay, through which the Wadeway was cut, was dated to the historic period - most probably the Roman or post-Roman period at earliest. Walnut pollen was found at the base of the clay, and this tree is widely thought to have been introduced by the Romans into Britain and Western Europe. Hemp pollen was also identified, which is also to some extent diagnostic of the medieval period. Towards the top of the clay, an increase in pine pollen may represent the 18th century introduction of planted pines. It was only possible to give an indicative date for the gravel from which the Wadeway was constructed. An environmental sample near the base of the gravel did not contain any hemp or pine pollen suggesting the gravel dated some time between the post-Roman period and 1700. Significantly, the excavation reveals that the Wadeway is not a prehistoric feature, although the broad dating of the causeway to the Roman or post-Roman period at the earliest could be improved using radiocarbon dating. The excavators suggest that the Wadeway could have been built on a topographic rise - so a natural ridge may have been used to cross between the mainland and Hayling that was only consolidated with gravel much later. Wessex Archaeology undertook geophysical and auger surveys in the AONB. The geophysical surveys consisted of a seismic refraction survey and a geo-electrical survey. The seismic energy travels through the ground along refracted pathways between different geological layers before returning to the surface where it is detected by geophones (an instrument for measuring ground motion). 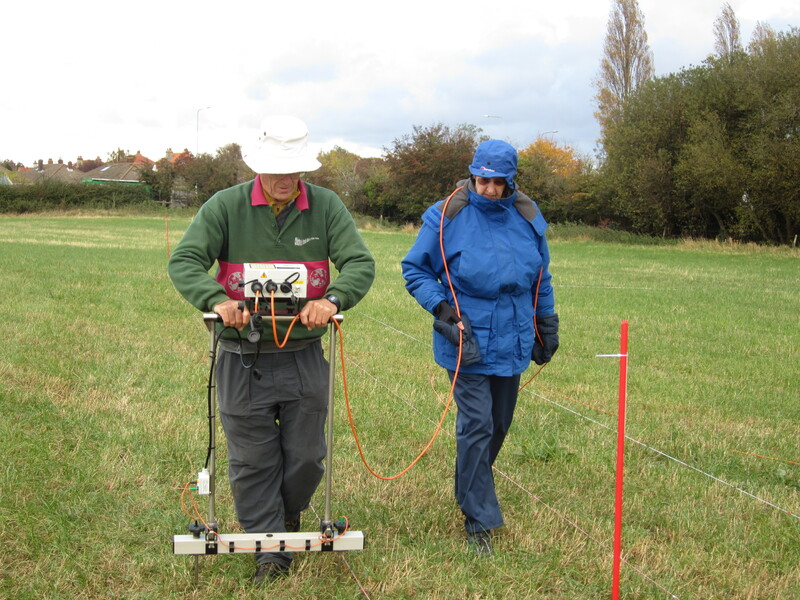 A geo-electrical transect uses an array of electrodes to inject a current into the ground and then to measure the electrical resistance which varies due to the physical properties of the geology. The auger survey used a gouge auger to acquire sediment samples of up to 6m in length. At Bosham and Bosham Hoe, thick sequences of Holocene alluvium were identified, overlying brickearth in places at the latter location. A palaeochannel feature, an ancient watercourse, was identified at Horsepond, and a possible clay pit, perhaps associated with the Roman tilery, was found at Copperas Point. At Fishbourne Channel, the auger survey confirmed the results from the marine geophysics that this area consisted of thin sequences of silt and gravel above bedrock and so would have been unsuitable for Roman cargo vessels. Here is a list of the available reports on this subject. Contact nicky@conservancy.co.uk for more information.